"What I Wish I'd Learned in School"
Includes both print and Google classroom versions. 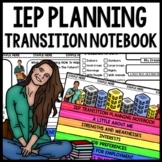 This is an individual transition plan as well as a holistic assessment for IEP's. We include this sheet with every IEP. It brings meaning and depth to our discussions and allows us to interview students on their greatest passions before the meeting. This is a job inventory designed for students with autism or developmental disabilities. This mini unit asks students what job they want to do. It also identify skills they need to do the job. 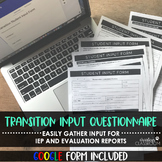 It is perfect for IEP's where transition is being discussed. 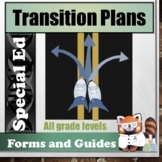 Provides new and seasoned teachers with a step-by-step process for writing excellent transition plans into their IEPs! Includes each category and also gives examples of what can be written in each category. Works specifically well with IEP online. This is a form that I created with information that I thought would be useful when receiving a new student from another grade or another school. 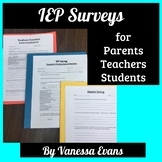 This form is for students who have an IEP. Teach your students to lead their own IEP. Great project in Self-Advocacy and Self-Determination. I have used this template for 2 years with great success. This drastically shifts the tone of meetings from uneasy to positive by focusing on what's most important - the student. I made a very short visual questionnaire for students with disabilities. The questionnaire uses real life pictures that better increase comprehension of the questions asked in a standard IEP meeting. This worksheet is a great starting point to begin the conversation for a student's transition plan. It discusses strengths, weakness, career ideas, and future living situations. 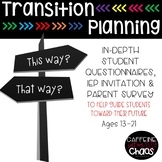 Use this picture-supported Individual Transition Plan (ITP) packet with your student to design a student-centered document for the IEP. In Transition to Adulthood, IDEA 2004 requires transition-related goals and statements in the IEPs of students preparing for life after high school.